It’s a ubiquitous wish for humans to explore the depths of the Earth. And little wonder, as there is no other place in our galaxy that holds such beauty and splendor (that we know of). Unfortunately, the number of people that actually get to travel worldwide is pathetically small, restricted by finances or opportunity. Fortunately, there are apps such as Fotopedia Heritage (in cooperation with UNESCO) that brings the world to our fingertips. With 25,000 photographs of 3,000 global points of interest, it goes a long way to scratch the travel itch. You can choose one of two paths when starting the app: go on a photographic journey, or view a slideshow. The slideshow is pretty self-explanatory. Once you start, a shuffle of pretty photos will slide through the screen. If you wish to stop, just tap anywhere on the screen. On the other hand, choosing to go on a journey is like going around the world with as many stops as you want to plan. The journey starts with a random photo that the app chooses, but you can hit the Shuffle icon (top of the column on the left side) to see a photo from a completely different part of the world. If you want just a little more control over your journey, tapping the world icon will take you to a map view of the world, with pins indicating points of interest. Pinch-zoom to widen your view. People who prefer a list view over the visual map can use the Search icon, which will list out the areas starting from continents all the way down to cities. Once you hit upon the starting point of your journey, feel free to go through all the photos that the area has to offer. 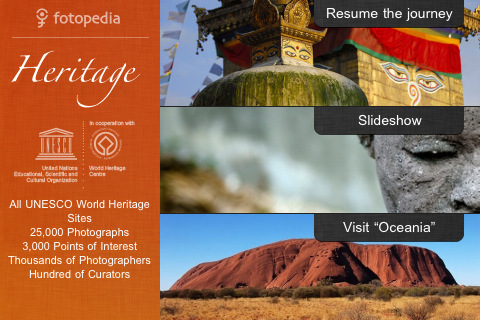 If you come across a particularly appealing photo, you can read more about it by tapping the Info icon, which will bring up text from both the UNESCO World Heritage site and Wikipedia. Share those appealing photos through Twitter, Facebook, or email. A feature that I love is the ability to save the photo as a wallpaper (aka your camera roll). 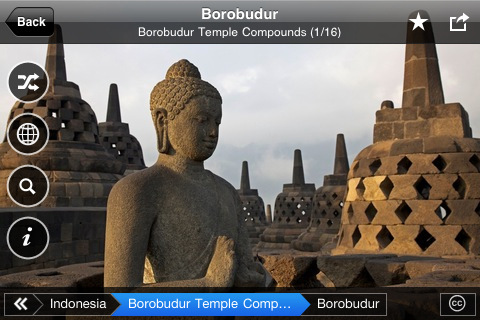 AppSafari review of Fotopedia Heritage was written by Julie Guan on January 30th, 2011 and categorized under App Store, Free, iPad apps, Photos, Travel, Universal. Page viewed 5049 times, 1 so far today. Need help on using these apps? Please read the Help Page.